Here's a riddle: Who has lots of questions, and uses just puzzles? Who bothers the Batman, and leaves him con-fuzzled? Let's face it, some villains are smarter than others. Whereas some sell guns and poison people with laughing gas, some villains are out there merely to prove that they're the best. That they're the smartest. Particularly against that irritating Batman. And by "some" we of course mean one villain in particular. Edward E. Nigma, or, as he's known in the Gotham crime circuit, the Riddler. The Riddler is always prepared to out-think the enemy, usually by using clever rhymes and riddles. So far, his intellect has been unmatched... aside from the Bat. If you have a child who clearly out-thinks their opponents, a child that is constantly testing other's intellect against their own, a child with a bit of a disregard for the rules, maybe you have a little Riddler on your hands. And if you have a Riddler on your hands, you may as well dress them as one. 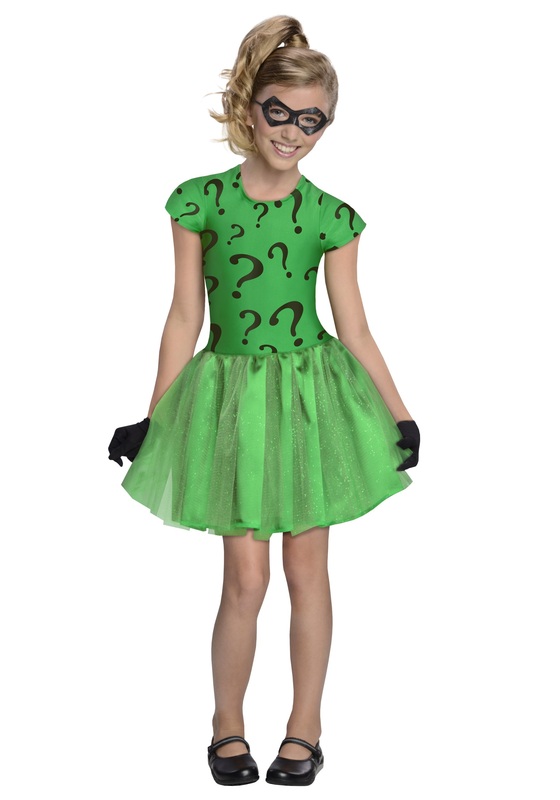 Our Riddler Tutu Costume is in Riddler's classic green, spattered with black question marks. This costume however, has a glittery green skirt. It also comes with black gloves and a green mask. Don't be surprised if, once your child puts this on, they start speaking only in riddles. It's part of the burden of being a genius we're afraid.